Originally native to the Mediterranean region, the hardy evergreen rosemary tree is one of the most popular and widely used herbs in kitchens today. In late spring, it blossoms into small pretty blue or white flowers. And it has been used in cooking, and in rituals and ceremonies, since the days of the ancient Greeks and Romans. Thousands of years ago, people noticed the effect of rosemary on helping clear the mind, and strengthen the memory. It was perhaps because of this noticeable impact on the the mind that legends, myths and rituals evolved around the herb. Legend has it the Virgin Mary rested behind a white flowering rosemary bush and after placing her blue cloak on top, the flowers had changed to blue! Hence the name "Rose of Mary". Today, research has proven that just the gentle aroma can indeed help sharpen the mind. And ongoing studies into its health benefits are discovering new stuff all the time. Read more about these. In medieval times, Europeans believed it would help ward off witches and demons! 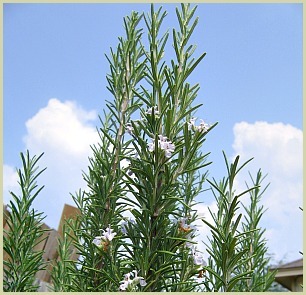 Sprigs of rosemary were also used in Ancient Rome and Ancient Greece as part of the wedding ceremony. Brides wore the pretty and fragrant herb in their hair or head dress, and newlyweds would plant it on their wedding night to symbolize their dedication to the marriage. If you love this herb like I do, then growing a tree or two yourself is a great and easy way to ensure a fresh supply all year round. It's actually one of the easier herbs to grow, and doesn't need much after care and attention. The rosemary tree can range in size from small shrubs up to 6 feet in height, and is equally at home growing in small pots to large hedgerows. Click here for cultivating tips.